The Incomparable was found in its rough state weighing 890 carats, and was found in the town of Mbuji Mayi in the Democratic Republic of Congo (formerly Zaire) in the 1980s. It was found by a young young girl playing in a pile of rubble outside her uncle's house. This rubble had been legitimately collected from old mine dumps from the nearby MIBA Diamond Mine, having been rejected during the recovery process as being too bulky to be worth scanning for diamonds. The girl gave the diamond to her uncle, who sold it to some local African diamond dealers, who in turn sold it to a group of Lebanese buyers operating out of Kinshasa. It was later purchased in Antwerp by the Senior De Beers Buyer. As a result, Sir Philip Oppenheimer, then president of the Central Selling Organization and a De Beers director, sold it to Donald Zale, chairman of the board of the Zale Corporation, the Dallas-based jewelry store chain. He bought the diamond in partnership with Marvin Samuels, of the Premier Gems Corporation, and Louis Glick, both prominent figures in the New York diamond industry. The huge stone was finally unveiled in November, 1984, which coincided with the Zale Corporation's 75th anniversary (their Diamond Anniversary). Shortly afterwards it was put on display at the Natural History wing of the Smithsonian Institute in Washington DC. The Incomparable in the hand of Leo Wins, master diamond cutter. 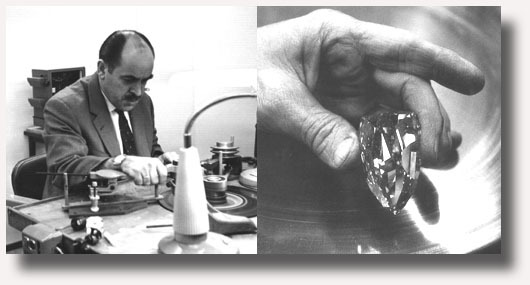 The job of overseeing the cutting was given to Mr. Samuels, renowned for his experience and expertise in the faceting of large diamonds. This diamond showed its fair share of problems. Its basic shape is extremely irregular: it was thicker at one end, narrower at the other; sunken and pitted on one side, ridged on the other. The surface was very rough, pitted with various gaps, cavities and cracks. At least it came as something of a relief that, after a part of the surface had been initially polished and the interior opened up (which is known as "cutting a window") for inspection, It was virtually free of inclusions. The Incomparable's 890-carat rough form, left, and the finished Incomparable in its gold ornament stand, right. Four years were spent studying and then cutting the stone. Its owners were faced with a dilemma: Should they go for a gem with a weight that would exceed that of the Cullinan I (530.20 carats) or fashion a smaller, flawless gem, by removing the internal inclusions. "Never forget it - 531 carats. That indelible, non-negotiable 531, and only one chance to get it," Samuels later said. However, during the course of the second year's work on the stone, Mr. Samuels and the cutters knew it would be necessary to give up any thought of surpassing the weight of the Cullinan I, despite the reluctance of some who continued to argue for size as opposed to perfection. mentioned in the paragraph below. Before faceting of the largest piece began, work was started on the 14 fragments that had been sawn from the rough stone. Mr. John Sampson White, then Curator of Mineralogy at the Smithsonian, examined these "leftovers" and he made an interesting discovery; the first thing that caught his eye was their variation in color. He had handled the 890-carat uncut stone many times before but he had never noticed any differences of color within. Some of the fragments were rich yellow with a slight brown overtone, like a smokey amber; others were a pale yellow, and the rest were virtually colorless. Those with the brownish tone had come from the darkest zone of the crystal, but making up just part of the crystal's surface, most of this dark material had been removed. 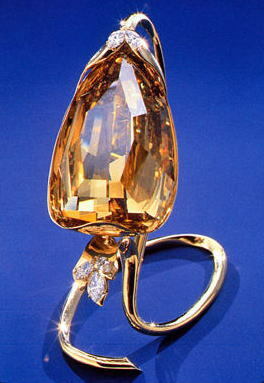 With this removal, the final body color of the diamond turned out to be mostly a medium yellow color. Mr. Sampson White's examination caused him to realize that the rough stone had not been uniformly colored, but extraordinarily color-zoned. That is, the crystal had been composed of sharply defined areas of differing colors, each color representing some change in the environment that must have happened as the crystal was growing. 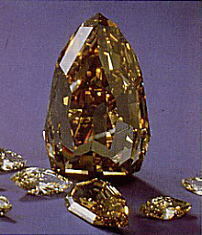 At one stage, the stone had been colorless, then nature had added a thickness of pale yellow diamond, followed by a "skin" of smokey amber-colored diamond. 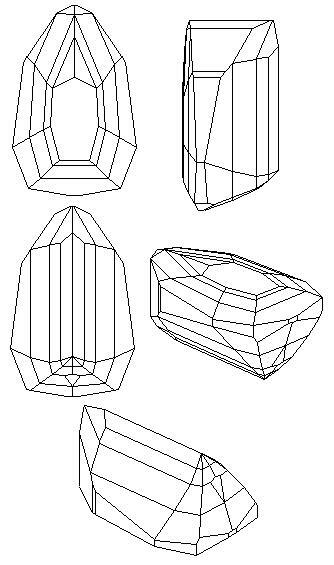 From the fragments, fourteen satelite gems were cut, the largest being a kite shape of 15.66 carats; the others of varying shapes, weighed 6.01, 5.28, 4.33, 3.45, 3.32, 3.31, two weighing 2.74, 1.99, 1.74, 1.63, 1.52, and 1.33 carats. The Incomparable's very unusual facet pattern, as captured from its Gemcad file. If you'd like a copy of this file, please email me. 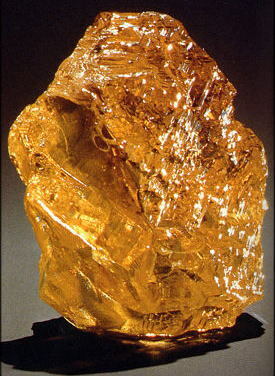 The biggest piece of rough ultimately yielded a gem weighing 407.48 carats; it is the third largest diamond ever cut, only the Golden Jubilee and Cullinan I are larger. It measures 53.90 × 35.19 × 28.18 mm, and has been graded by the Gem Trade Laboratory Incorporated as a Shield-Shaped Step Cut, Internally Flawless clarity and Fancy Brownish-Yellow in color. GIA later graded the stone in 1988. Its unusual triangular shape elicited a new imaginary term from Marvin Samuels -- a "triolette." Prior to its appearance at auction in New York on October 19th, 1988, the diamond was offered at Christie's in London where it was called "the Golden Giant." However, when the gem came up for auction again it had been renamed Incomparable, the largest diamond ever offered to the public for sale. It was hoped the diamond would fetch $20 million but it was withdrawn from sale when bidding failed the seller's reserve price (which actually was $20 million). Either way, history had been made: the late Theodore Horovitz of Geneva, placed a bid for $12 million, the highest price ever bid at auction for a single stone at that time. Louis Glick is said to still own the stone to this date. In November, 2002, the Incomparable appeared on the internet auction site Ebay. The seller wanted an opening bid of about $15 million (I can't remember the exact number). Oddly, the word "Incomparable" was never mentioned anywhere in the text of the auction. The auction's time ran out, the stone remained unsold. The specifications of the stone itself were listed, as was a scan of the stone's GIA certificate. It is now the largest diamond ever offered on Ebay, or any other internet auction site. British gemologist Michae Hing was able to handle the stone personally and has a funny story to tell about it: "The [stone's] stand is shaped like a polished golden spoon, with the handle of the spoon bent round to form the base. The spoon acts like a mirror to reflect the light and make the stone more brilliant and more orangy. The diamond is cut so fat, it’s almost cylindrical, and it looks much better in the stand (it just clips into place - there’s a sort of springy clip inside the lip of the stand). When I was in London, they took out the diamond for cleaning and they accidentally put it back in upside-down, so it was on display with the culet facing upwards for several weeks before I came back and pointed out that it was the wrong way up! Tens of thousands of people must have seen it, but nobody noticed." Sources: Famous Diamonds by Ian Balfour, The Nature of Diamonds by George E. Harlow, various magazine publications, and the GIA website.